Uh, guys, you’re missing the Eiffel Tower. No, really, you’re practically in its shadow. Our friend Chris Plutte was living in Paris; he took Sally and me to a restaurant called Le Gamin. The waiter had a dry sense of humor; he enjoyed acting the part of a stereotypically rude Parisian. We’d ask for something, like more water, and he’d huff “non”… and then would smile and get it for us. After the meal, Chris wanted coffee, and told the waiter to bring the “special coffee” for madame. He returned a couple of minutes later with a cup and saucer; as the waiter started to place it in front of Sally, he pretended to stumble. The cup and saucer clattered, and for a split second it looked like she would get showered with hot coffee… but the cup was empty. We all laughed, and the waiter was pleased that his little joke had worked again, for what must have been the thousandth time he had pulled it on someone. Here’s another travel experience that had nothing to do with the scenery: While waiting for a ferry boat on Ambergris Caye in Belize, a guy in a ragged T-shirt and swimming trunks struck up a conversation. Well, it was more of a monologue, really — he went on at length about how great it was to live in Belize with its natural beauty, fantastic dive spots, friendly people, etc. He told us that he had sold all his belongings back in the States but had no regrets, because he was loving the life he’d made here in Belize. I asked him how long he’d been living here. “A week,” he said. Several hours later we were in the vicinity of that same ferry dock in San Pedro Town again. As we were wandering by a beach bar ironically called Amigos del Mar, we heard two guys snarling at each other: “Go away.” “No, you go away.” “Yeah? Let’s see you make me.” It went on in that vein; as we passed, we noticed that one of the combatants was the guy who had moved here from the U.S. a week ago. Every trip seems to have memorable street scenes like that, but for now I’ll conclude with an experience in New York City that had figurative and literal resonance for me. In the massive subway station under Times Square I heard what was, for me, an unmistakable sound: A guy was playing a saw with a violin bow. My dad had played the saw, although not nearly as well as this old black man in the subway. I put some cash in the street musician’s tip container, partly in appreciation for bringing back a memory of my childhood, even though I was many miles (and many years) away from home. It seems fairly obvious that the reason most games and sports afford a thrill when you win is because they involve competition. Having to prove yourself against an opponent is essential, and the more formidable the opponent, the sweeter the victory. That’s how humans are wired, anyway; whether horses also think like that may be debatable, but one can’t deny that some of the greatest rivalries in sports have been in thoroughbred racing. Secretariat was the Triple Crown winner in 1973, but the horse that pushed him to record-setting times was, as you may recall, named Sham. Another of the greatest race horses of the 20th century was Alydar, who has the distinction of being the only horse to finish second in each of the Triple Crown races. In the 1978 Kentucky Derby, teen-aged jockey Steve Cauthen coaxed Affirmed to the wire 1½ lengths ahead of Alydar, who had been a slight favorite. A couple of weeks later, Affirmed was the favorite in the Preakness, partly because it is contested at a shorter distance. He went to the front as usual, but Jockey Jorge Velasquez got Alydar moving up at the half-mile pole and closed ground on his rival. Ultimately, though, Alydar lost by a neck. It was the third of that year’s Triple Crown races — the Belmont Stakes — that is considered by a lot of track old-timers to be one of the greatest duels in the annals of horse racing. Affirmed took the early lead; Alydar was third. The fractions were slow, but by the mile pole Alydar had gotten alongside the frontrunner and the pace quickened. The two rivals left the other horses behind as they charged, stride for stride, into the far turn. As they thundered down the stretch, Alydar briefly managed to take the lead, but Affirmed fought back. Cauthen and Affirmed crossed the finish line a head in front of Velasquez and Alydar, clocking one of the fastest times in Belmont history. In those 1978 Triple Crown races, Affirmed won all three over Alydar, but by a combined total of less than two lengths. Their final meeting came in August of 1978, in the Travers Stakes at Saratoga. Most trainers recognized that they had no chance against the titans; only two other horses were entered. Meanwhile, Steve Cauthen had been injured, so Laffit Pincay, Jr. was up on Affirmed. 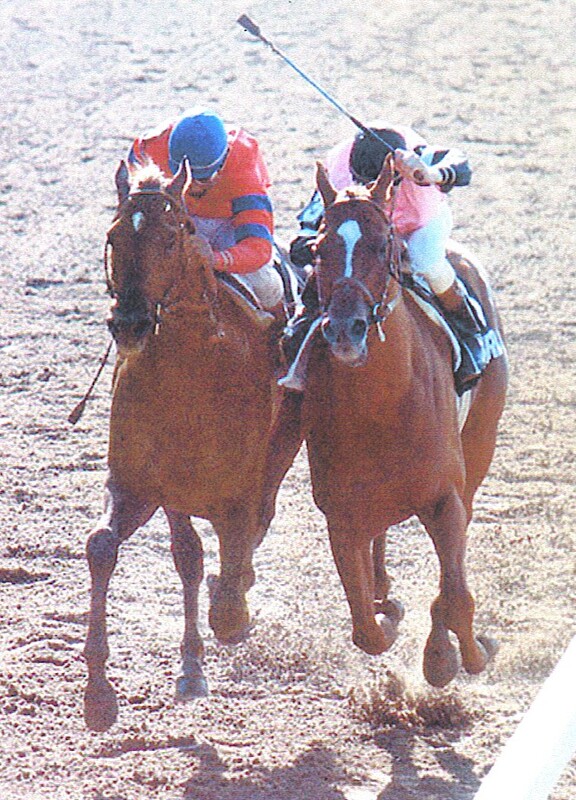 Once again, Affirmed took the lead, but as they headed into the far turn, Alydar came charging along on the inside. Pincay steered Affirmed toward the rail, cutting off his rival. Alydar stumbled, almost launching Velasquez out of the saddle, but horse and rider managed to recover and started sprinting after Affirmed again. The Triple Crown champion held on and finished ahead of Alydar, but a steward’s inquiry resulted in the disqualification of Affirmed — Alydar was placed first. Over their careers the two horses faced each other ten times, with Affirmed winning 7 of the races. Affirmed was the better horse, but Alydar was a close second. You might say that Affirmed’s greatness was affirmed by the excellence of his rival Alydar. Within seconds my mask and snorkel were in place; I joined her and probably made a similar sound. Our traveling companions, Jen and Bryan, did too. The scenery just below the ocean’s surface at Australia’s Great Barrier Reef is spectacular. In contrast to the desolate expanses of the Outback, it is teeming with life. In fact, Encyclopædia Britannica calls the Great Barrier Reef “the largest structure ever built up by living creatures.” That refers to the coral polyps whose skeletons have accreted over many millennia to form the reef. It is actually a chain of several thousand individual reefs (and several hundred islands) that extends for about 1,600 miles along the northeastern coast of Australia. In places the reef is as close as ten miles to the mainland; in others it is as much as 100 miles off shore. There are resorts on some of the islands, and there are many tour operators and boats that provide access to the Great Barrier Reef from towns along the mainland. We were based in Cairns (pronounced like the first syllable of Kansas, to which it bears no resemblance). The trimaran trip from there to the outer edge of the reef took over 3 hours, but that included intermediate stops the boat made to pick up passengers in a couple of other towns. A straight shot from, say, Port Douglas would take about 90 minutes. At Agincourt Reef there is a docking platform, and it wasn’t long after the Quicksilver VII had parked that we were in the water and hooting into our snorkels, as described above. Among the attractions were many varieties of coral, one of which was cobalt blue. 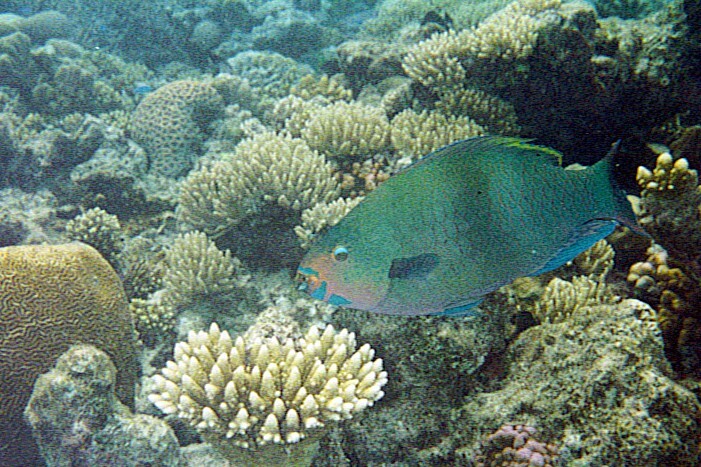 The tropical fish one expects to see around reefs were here in abundance: damselfish, butterflyfish, parrotfish, Moorish Idols, triggerfish. Not only were there lots of them, they seemed to be larger than specimens we had seen in other parts of the world. Maybe that was only an illusion because we were seeing them in unusually clear water, and because some of these fish came in colors that were as vivid as neon. We also saw some giant clams that were 3-4 feet across, which presumably means they were quite old, like maybe a hundred years or so. All of these life forms thrive inside a barrier reef, which provides protection from storms and waves and other threats to coastal habitats. Barrier reefs tend to be close to the edge of a continental shelf, and the Agincourt Reef section certainly was. The water where we saw all those beautiful things was perhaps 10-15 feet deep; from there we swam to the edge of the cliff, so to speak. The wall drops off abruptly to a depth of something like 150 feet. It was an odd sensation, like standing on the ledge of a skyscraper, except that we were floating above it. It was only with great reluctance that we finally got out of the water that day. We thoroughly enjoyed the down-under part of Down Under. There are thousands of books on raising children these days, not one of which would recommend the approach Johann Strauss I took with his son Johann Strauss II. The kid wasn’t easily discouraged, however, and his interest in having a musical career was abetted by his mother, Maria Anna Strauss. She may have been motivated in part by spite; her relationship with her husband was strained because he had a mistress. Junior was 9 years old when his father got involved with Emilie Trampusch, who eventually had 6 children with the elder Strauss. That was grounds for divorce back then; when Maria Anna served papers on him, Strauss Senior shrugged and moved in with his illicit family. With him out of the house, Maria Anna did her best to further Strauss Junior’s career in orchestral music. That doesn’t seem to have happened, though. During the Revolution of 1848, Strauss Senior remained loyal to the monarchy, but Strauss Junior sided with the revolutionaries. It just didn’t work out between those two, and when Dad died of Scarlet Fever in 1849, I’m guessing that Johann II must have been conflicted about attending the funeral. After all, when Johann II’s wife died in 1878, he didn’t attend her funeral, and he liked her. He mourned her death for several… well, several weeks, when he married someone else. By now you’re probably getting the impression that I’m just ripping the Strausses, so let me tell you something positive about them — or at least about Junior, because he was the superior talent. Neither Strauss actually invented the Viennese waltz; it had been around as a folk dance. But by composing elegant melodies and writing more sophisticated arrangements, Johann Junior elevated the waltz from the beer halls to the concert halls — and palaces, too. The Waltz King, as he was called, toured Europe and America, spreading the popularity of that musical form. By the time he died in 1899, Johann Strauss II had written over 150 waltzes, as well as several operettas, some polkas, marches, and other compositions that were later used as soundtracks for cartoons. His most famous work, the Blue Danube Waltz, is one of the most recognizable melodies ever written, and is sort of the unofficial national anthem of Austria. 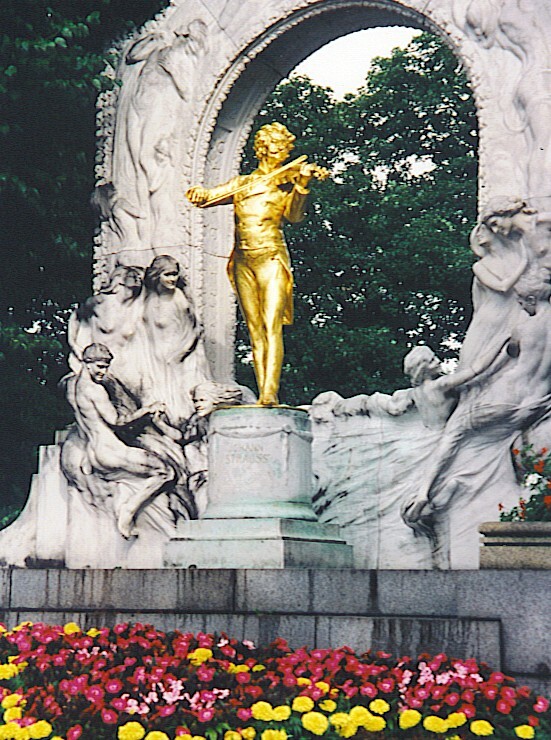 He is so revered there that a statue of Strauss occupies a place of honor in Vienna’s main park (see photo). The Waltz King’s career illustrates that there is almost no limit to what a man can accomplish when he has a parent who strenuously objects to his dream. How many books do you have? Don’t bother to get up and count them, just take a guess — fifty, a hundred, three hundred? Whatever you think the number is, keep it in mind when I tell you that in 1814, Thomas Jefferson had 6,487 books. With some reluctance, a congressional committee offered Jefferson $23,950 for his collection, which was substantially less than it was worth. 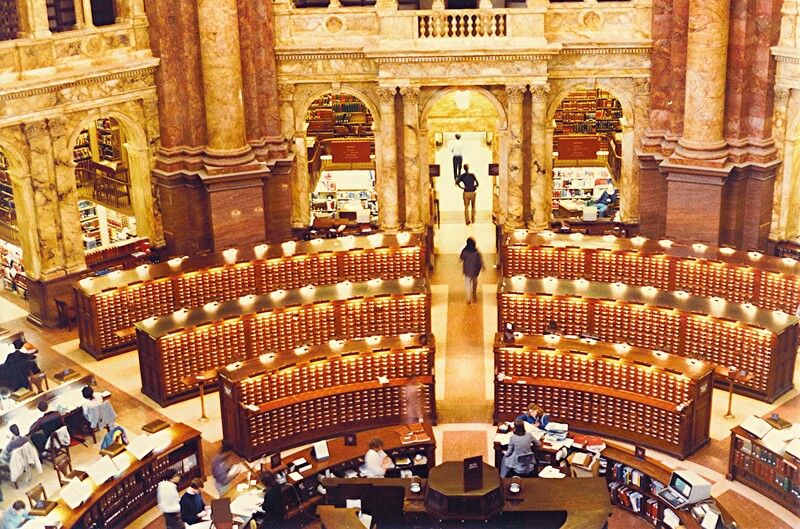 Jefferson accepted their low-ball offer, though, and his books became the basis for today’s Library of Congress, which happens to be the world’s largest library. Its website currently states that the collection has more than 34.5 million books. There are also 13.4 million photographs, 5.4 million maps, not to mention millions of manuscripts and pieces of sheet music and newspapers and movie scripts. The whole collection is approximately 152 million items. And you thought that weird old guy down the street was a hoarder — psshhh! By the way, that 152 million items is today’s count. Several thousand more will be entering the inventory tomorrow, and the day after that, and so on. All of those items are currently stored on about 838 miles of bookshelves — roughly the distance from St. Louis to Denver. Can you imagine dusting those shelves? What I find even more mind-boggling (and my mind is not easily boggled) is that the Library of Congress is expanding its collections beyond things recorded on paper and parchment. It is now also the repository for digitally-created documents, including Twitter tweets. OMG!!! It seems to me that what your friend had for dinner or what they think of that dreamy guy on American Idol is of dubious value, but our national library takes its mission seriously. On its website, the Library of Congress asserts that it is “the world’s most comprehensive record of human creativity and knowledge.” And that’s what all writing is, really: a way to preserve thoughts. Even if they aren’t particularly good thoughts. Meanwhile, the U.S. Copyright Office (a part of the Library of Congress) is working on legislative solutions to make it possible to digitize out-of-print works. The objective is to create a universal digital library, so that citizens can have instant access to works ranging from Sir Isaac Newton’s Principia to Mia Farrow’s autobiography. When everything eventually does make the transition to digital, it will reduce the chances of a loss like the one the Library of Congress sustained on Christmas Eve, 1851: There was another fire, this one caused not by the British, but by a faulty chimney flue. Two-thirds of the collection went up in smoke, including most of Mr. Jefferson’s books — and, presumably, several works on the subject of fire prevention.